Looking for an entry point into an innovative company? 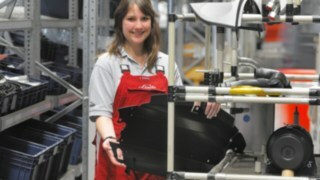 At Linde Material Handling, we offer the ideal basis for a successful start to professional life. Experience the fascination of digitalization and work on shaping the future of intralogistics in a wide range of different ways – whether in manufacturing, quality inspection or logistics. Choose your apprenticeship in one of our numerous fields of expertise. When it comes to supporting and challenging young people, we can draw on more than 75 years of experience: In addition to imparting well-founded specialist knowledge in your particular profession, your apprenticeship also focuses on personal and social development. Because, as a leading global manufacturer of forklift trucks, warehouse handling equipment, and system solutions, we know that our employees are the basis for our success, today and tomorrow. Experienced instructors accompany you throughout your apprenticeship. At the same time, you get to know us and learn more through supplementary seminars. If you perform well and work proactively, you will have a chance during your apprenticeship of a four-week stay at one of our sites around the world. Upon completion, you will understand the central structures and processes in a large international company and possess sound specialist knowledge; this will be an excellent foundation for your future career. No matter which apprenticeship you decide on, get involved, think in a customer-oriented way, and have the right level of ambition. Do that, and we will welcome your application. Cover letter: Tell us about your personal experiences, aims and why you want to work at Linde. Why are you applying for this apprenticeship in particular? Copies of certificates: Provide evidence of your experience so far – find out which certificates you need to send us in the careers section for your country. To find out how to apply for a place in an advertised apprenticeship in a particular field and site, please refer to the careers section for the country in which you would like to work. After submitting your application we will review your documents, which can take some time depending on the number of submitted applications. If we are interested in you, we will invite you to an interview. Do you have general questions about apprenticeships at Linde? Contact us using the form below if you need more information about apprenticeship opportunities at Linde. If you have questions about a specific position, please direct them to the contact person listed in the relevant posting. We will try to get back to you as soon as possible!